Unlocked phone reseller, Expansys, has created its own Samsung Galaxy S4 landing page ahead of launch with a set of renders and specs, most of which all seem just a bit fishy. If you jump below, you’ll quickly realize that the pictures used are the same pictures we saw in a purported leak late last night. We called them questionable then and aren’t going to back away from that now. Think about it for a second – an online retailer that makes a living selling unlocked phones, creates a landing page early for the device that will likely be the top seller in the world this year. Not a bad move if you are looking to get in the search engine rankings early, right? So here is where I have some issues. First, the phone itself has no physical home or hardware buttons. Samsung, with all their resources and different models of phones, have continued to stick with a physical home button, followed by soft keys for both back and menu. Even with the Android team trying to push on-screen keys, Samsung has stuck to their layout as its customers have become familiar with the setup. We also have reports of them not changing up the look much with the Galaxy S4 coming straight out of Korea. These renders, go completely against that notion. Second, the font used on the render of the Galaxy S4 is not even close to the font that we have seen used time and time again by this company. It really just looks like it was placed there, just to be placed there. Shouldn’t the display be showing off TouchWiz just like all of the renders behind it are? Third, where is the Samsung logo on the device? Fourth, why does the side angle of the device look like the jankiest render we have ever seen? Look at the rigidity of the top of the angled phone and its bottom left corner. Did a PhotoShop 101 student make this? 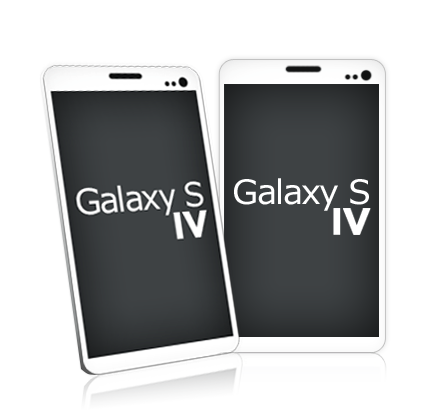 Fifth, all of the promo materials and press invites for the Galaxy S4 have used the number “4” rather than the Roman numeral of “IV.” This is mostly speculation on my part, but I wouldn’t be surprised to see Samsung ditch the Roman numerals this time around. Sixth, let’s talk about specs for a second. All of the specs listed by Expansys are what all of the random rumors from the last 6-8 months have reported. It talks about an Octa processor, 13MP camera, storage, version of Android, and the display type as being 5-inches and 1080p Super AMOLED. The problem is, in the two lines that would actually represent a confirmation on these being official – battery life and dimensions – we have empty sections. Hell, I could have compiled this list in about two minutes time. Look, I’m all for this render being real and these specs being legit, but I just have a hard time buying into what we’re seeing here. If the device ends up being fully edge-to-edge, semi-square, and without physical navigation buttons, I may be the happiest man on Earth. For now, I’m not ready to fully commit, especially after Samsung trolled us all leading up to the unveiling of the Galaxy S3 by pushing out devices in dummy boxes all over the world. For all we know, these could be placeholder renders that Samsung is sending out to retailers. But hey, if anything, at least Expansys just got a link back to their Galaxy S4 page. So at least their rankings for the page should be all juiced up and ready for when the real phone is actually unveiled next Thursday in New York. Update: As users have pointed out, the bottom of the site reads “Careful: these are not official characteristics and are subject to change after the official device announcement.” So there you go, nothing to see here. Update 2: Expansys has actually come out and admitted that these were nothing more than a mock-up that one of their designers made as a placeholder. In fact, they actually said that @evleaks “stole” them.